increase the adoption of E-Learning and contribute to the success and engagement of students. enhance the student experience, skills and satisfaction to increase retention and throughput. encourage a culture of innovation and continuous improvement in learning and teaching and in particular blended learning. establish an environment that will encourage uptake and embed E-Learning in core practice. support the institution’s goal to deliver a “student-centred” learning experience through E-learning. VUTELA – a blackboard propriety based learning management system (LMS) which is externally hosted to ensure reliability, scalability and sustainability is the institution-wide LMS. E-learning unit launched its funky project Espresso on the vibrant platform VUTela. We have reached a point at VUT whereby VUTela use has increased sufficiently for us to advocate for the deeper, more engaging use of VUTela that will foster improved teaching and learning in a blended delivery mode. Mehta, et.al. (2017) state that if a course is designed well, with due diligence to instructional design elements, such as course organization, direct instruction and quality assessments, it adds to the value that students derive from the online component of a blended course. Project Espresso will not only enable this new, more operationally efficient model of academic delivery to take place but it will transform the institution from a traditional contact based centre to one which can operate and perform across multiple levels of engagement, spaces and markets for further student enrolment. 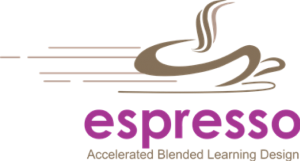 The name: Project Espresso is a play on the name of the Espresso blended coffee and accelerated (express) development by a team of professionals supporting lecturers to maximize their efforts in delivering a blended learning module. The project is divided into two complimentary processes that run concurrently: Digitization and Deployment / Blended learning facilitation. The goal of the digitization process is to render 50% of the 1400 modules by 2020 in all four faculties for greater engagement and uptake by students for learning development and delivery. The goal of the Deployment / Blended learning and facilitation project is to build the capacity of lecturers at VUT in the design, development and implementation of a blended learning module and the facilitation thereof. One of the key outcomes of this project is the transfer of skills of instructional design and content development to e-learning staff and academics of VUT. The Graphic design unit of CAD will work in close collaboration with content developers to design the graphical elements of a module in VUTela. You are hereby invited to attend a 2-day Deployment workshop from 9:00 – 16:00 on the VUT Campus. The purpose of this workshop is to explore open learning principles in relation to a blended learning approach and to materials design. 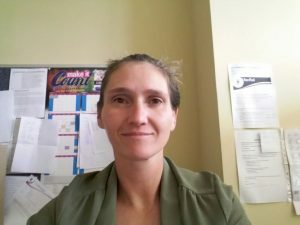 Ms Maryla Bialobrzeska – Curriculum, learning design and distance education/blended learning/self-directed learning materials development specialist. Ms Sheila Drew – Early Childhood Education Programme specialist with particular focus areas including support for programme design and materials development for teacher education in the Foundation Phase and ECD. Participants, please bring along laptops, existing course materials including module outlines and Learner guides. Going forward, you will meet with Eiffel Corp to digitise your courses, take your Activity designed during the workshop and digitise for VUTela, avail yourself for 1-day follow up workshop and an Online Facilitation Course (4 weeks, starting 20 April 2018). Looking forward to fruitful discussions and engagements. Back at it with another catch-up session, this time around with Dr. Sharp who is a Consumer Behaviour lecturer in the Marketing and Sport Management Faculty. Now, she said it from the word ‘ go’ that she’s not a fan of Technology but with the number of students that she has, using Vutela has been helpful. Vutela was introduced to her in 2014 but it wasn’t fully functional and couldn’t be used on a regular basis. In the year 2015, she then signed up for the instructional design training that was offered by the e-learning unit. This helped her gain more insight on how beneficial Vutela can be to an individual as an academic. Although she still found the site unreliable after the training, she didn’t give up on using it as her help. In 2016, a bright light shined into her life in the form of the Espresso Workshops, which helps lecturers find more innovative ways of teaching and learning how to blend technology together with the traditional way of doing things. In her view, students aren’t serious about the using Vutela as they have found it to be a daunting experience. She has had to be that extra push for her students to be proactive when it comes to school work. Although her students are not highly enthusiastic about working online, she also allows them to contact her on her e-mail where she can help them with what they’re struggling. As she has mentioned before, technology is not her thing, reason for this would be that she finds it to be unreliable at times and that keeping it updated is a lot of work. Dr. Sharp has subsequently changed her view about top Vutela to the point that she now feels that Vutela has come to her rescue. 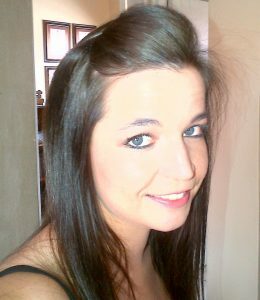 She can now employ different teaching styles as an academic. Exploring is part of the growing process. Well, she had to think out of the box with this last one. Regarding leaving her mark at VUT, dr. said that she would actually want to create a more interactive platform for her students. She would then use this platform to advertise her work and attract more students to the school and also have students to be more proactive; which could be beneficial to them. Nice one, Dr Sharp! I had a sit-down chat with Ms Tesnear who is part of the Marketing and Sport Management Faculty. She then took me on a journey about how VUTela has helped her in the past year or two. She seemed quite enthusiastic about the use of VUTela as an academic. She answered a series of questions which gave more insight into her view on the use of technology and how she has incorporated it into her daily traditional way of teaching. At first, VUTela was the one thing that just did not fit into her way of teaching her students, ‘it just didn’t blend’ in her view. After attending the VUTela Lecturer Training, she then realised the importance of using VUTela as an academic. It sure has made things easier for her and she has found a balance of blending in technology into the traditional way of working with her students. Now her students can access their work on Vutela and have guidelines as to how to complete the tasks given. But then again, she doesn’t know exactly how her students feel about using VUTela and what challenges they encounter as students. The perceptions of students are difficult to read as they are not very vocal when they come across difficulties in their studies. During this chat she did say that she’s not a tech-savvy person and she still enjoys her human interactions with her students. She finds technology as an assistant to her way of doing things and it helps ease the strain of having too much work during classes. She has made room for students to discuss and ask questions based on the work that has been posted online and she is active enough on VUTela to assist them. Like any other person on earth, leaving a mark is important. Making her mark for Ms Tesnear means that she would use VUTela as her assistant in enabling more effective teaching translated into having more of her students pass the course. She would also want to remove this mental block that students seem to have about using technology when it comes to school work; that’s the impact she wants to have on students. You go Ms. Tesnear! So, on a monthly basis, the E-learning unit has the Espresso Deployment workshop that is offered by Eifel Corp and SAIDE for lecturers to attend. These workshops are there to help lecturers learn more about using Vutela and how they can design the module better for them to use as well as for the students. Since Vutela has become an essential tool for both lecturers and students, these workshops are held to help academics filter their work and make it easy for students to access their work when necessary. Some lecturers are known to be BBT’s (born before technology) and need to get equipped with the tech skills to produce a successful academic outcome. During these workshops, lecturers are free and able to brainstorm and exchange ideas about how they can use Vutela creatively for their students. How to make it more interactive, have more tests and activities that are related to the work that has been covered in class so students can reflect and test their knowledge. Time and time again lecturers bring up the issue of having a large number of students in lecturer halls and how it makes it a difficult for them to know whether the class is progressing, on the same page or even understand the work that is being taught in the classroom. Some students come to varsity and do not know what to expect or what is expected of them to succeed at university level. Some still find writing on the chalkboard way more helpful as they come from a background that relied on it. Other ideas that are constantly put on the table include lecturers coming together and finding a way to work with one another and finding a schedule that will work well for the students to not go into some sort of ‘information overload’ especially during semester tests. Another vital one was the one of lecturers actually sacrificing their class time to allow students to attend the Vutela student training, as we all know, not every student is tech-savvy. These workshops should continue to help lecturers find a balance that will work better for them and their students in integrating online and offline studies. More life to the Espresso Project!